The earlier that hearing impairment is detected and properly treated, the better the chances are for children with hearing loss to grow and develop as other children of their age. The period from birth until the age of three is a critical one since at this time children develop communication, social and cognitive skills by means of language and speech. As soon as the hearing impairment is detected, we fit the baby with a suitable hearing aid and give him weekly speech sessions with a special teacher. We test his hearing often in our audiology lab to monitor his progress. Also, we give councling to parents on how to communicate with their baby. 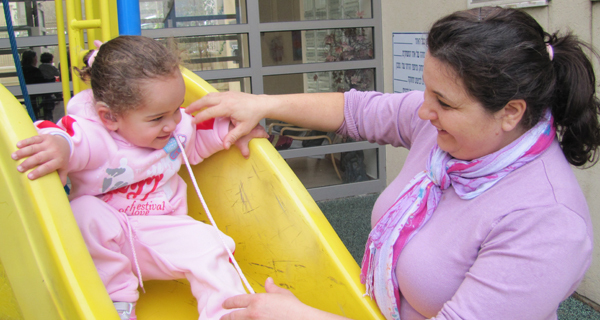 At the age of 1 year, the infant enters our rehabilitation day care for a full program including language, comunication and social skills. This is the basis for Micha’s policy of Early Intervention – to start working with the hearing deficient child and his family as soon as possible.